Typical measles is reliably diagnosed on clinical grounds; laboratory diagnosis may be necessary in cases of modified or atypical measles. Nasopharyngeal and conjunctival swabs, blood samples, respiratory secretions, and urine collected form a patient during the febrile period are appropriate sources for viral isolation. Monkey or human kidney cells or a lympho- blastoid cell line (B95-a) are optimal for isolation attempts. Measles virus grows slowly; typical cytopathic effects ( multinucleated giant cells containing both intra- nuclear and intra- cytopalsmic inclusion bodies) take 7-10 days to develop. Shell vial culture tests be completed in 2-3 days using fluorescent antibody staining to detect measles antigens in the inoculated cultures. However, virus isolation is technically difficult. It is not routinely performed for diagnosis as sensitivity is lower than serologic techniques. 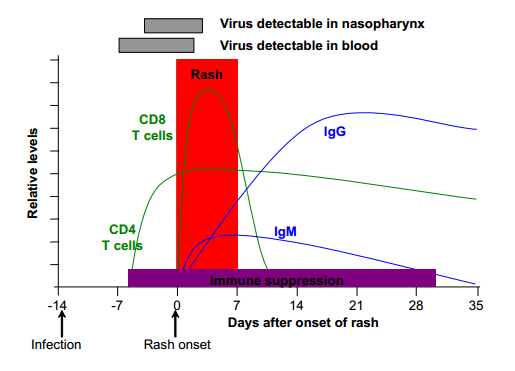 Serologic confirmation of measles infection depends on a fourfold rise in antibody titer between acute phase and convalescent phase sera (where the second serum sample is collected at least 10 days after the first, acute sample) or on demonstration of measles specific IgM antibody in a single serum specimen drawn between 1 and 2 weeks after the onset of rash. IgM antibody levels peak after about 7-10 days and then decline rapidly, being rarely detectable after 6-8 weeks. ELISA,HI, Nt tests all may be used to measure measles antibodies, though ELISA is the most practical method. IgG antibody levels peak within about 4 weeks and persist long after infection. The major part of the immune response is directed against the viral nucleoprotein. Patients with subacute sclerosing panencephalitis(SSPE) display an exaggerated antibody response, with titers 10 to 100 fold higher than those seen in typical convalescent sera. Haemagglutination–inhibition tests or ELISA antibody assays are most practical, but plaque reduction neutralization tests are the most sensitive and specific. The virus has been isolated from respiratory tract secretions and rarely from urine or circulating lymphocytes during the prodromal phase of illness or within a few days after the rash onset. Immunofluorescence staining of nasal or throat secretions or urine has been successful, but is not widely available. SSPE is confirmed based on characteristic EEG patterns and demonstration of measles antibody in the cerebrospinal fluid (CSF) with an increased CSF to serum measles antibody ratio, or by demonstration of virus in brain tissue. Very high measles antibody titres aside from acute infection and SSPE(Subacute sclerosing panencephalitis) are regularly seen in autoimmune chronic active hepatitis and occasionally in systemic lupus erythematosus.